During my travels in Central America I have hiked and climbed several volcanoes. Toward the end of my stay in Cartagena I visited Volcun Totumo which at roughly 18 meters high is by far the shortest to date. We booked the trip through our hotel and the cost was US$14 per person. This included round trip transportation (45 minutes each way) and a long soak. We declined the option of a lunch for an additional $5. 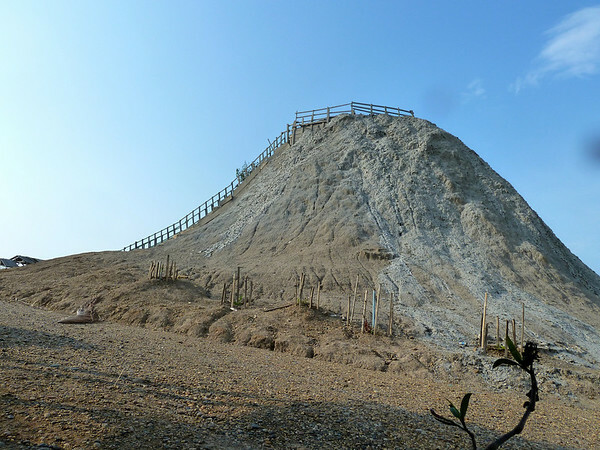 Once there it is a short climb up a series of wooden stairs to the top where you “plop” into thick warm mud. It is so thick that helpers push you down into the mud. 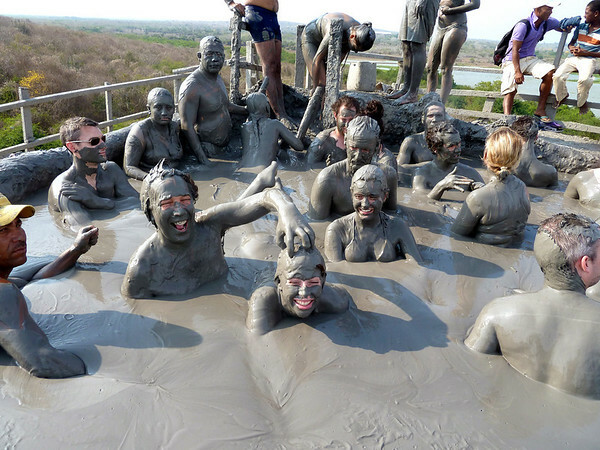 About 20 of us shared the mud bath for about 45 minutes. For an additional $2 you can give your camera to one of the helpers before you enter. They are very reliable and manage to remember who all the cameras belong to as they photograph you. For another $2 you get massaged while in the mud, well worth it. A note of caution to wear a snug swim suit. The mud is so thick that some soakers hung mud covered moons as they extracted themselves from the volcano. After soaking and massaging for 45 minutes, we climed out and down the stairs. As we headed toward the lake to wash off, we naturally posed for silly photographs. 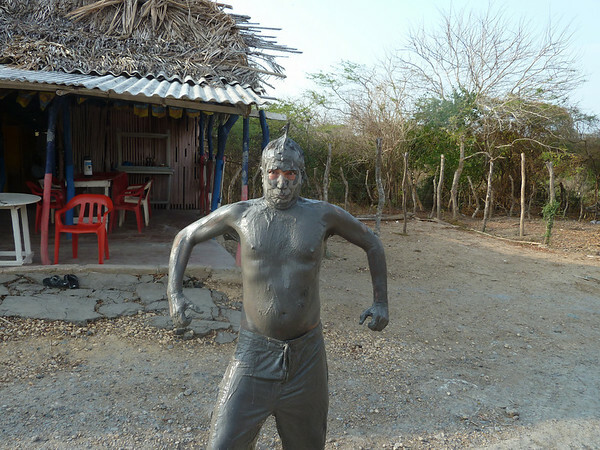 At the lake, you have another $2 option to have the local women wash your mud off. We declined this service. Following this treatment, ones skin is quite soft and smooth. All in all, it was an enjoyable afternoon. 4 Responses to Soaking in a Volcano! Sounds heavenly! And what a bargain! Glad to see you’re having a great time and reversing the “Ugly American Tourist” syndrome caused by so many others. Thanks Julie. I find just being a normal guy who smiles a alot (I do), is polite, and at least tries to speak a little Spanish go a long way toward changing old attitutes and buildig friendships. The mud does look really thick in your pictures. How fun! I tend toward the latter. Two thousand pesos can sound like a lot, but then I remember it is only a dollar. That dollar can go a long way toward feedin their family that day which makes it rather impossible for me to get offended or resentful. And besides, I always have to option to decline as I did with the finalwashdown in the lake.